Package Insert - Flottman Company. Many consumers do not have a complete understanding of how to use this treatment because they do not have experience with medical foods. 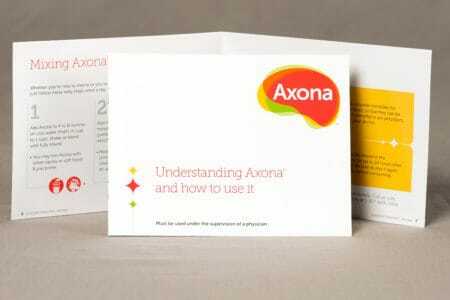 Include a folded printing package insert that fully explains the treatment and how to use it. The 12-page 5.25″ by 7″ self-cover booklet fits in easily with the product packaging, and provides a detailed overview of how to use the treatment. Consumers who receive this prescription have a simple and easily accessible way to learn about it. Flottman Company was charged with producing an informational package insert for an Alzheimer’s disease treatment. The treatment is a prescription dietary supplement that is used to improve the impairment of metabolic processes associated with Alzheimer’s disease. As a medical food, this treatment is a little different from a typical prescription. 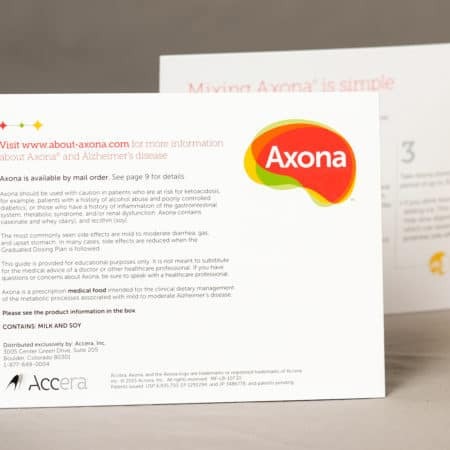 Therefore, it was essential for the company to include a folded printing piece with the product that gave a full explanation of their product. The resulting insert is a 12-page 5.25″ by 7″ self-cover booklet that fits in easily with the prescription packaging and provides a wealth of information on the treatment and how to use it. The booklet is branded to match the identity of the treatment, and includes bright colors and diagrams throughout for easy comprehension. By printing the entire piece on 80# gloss stock, we were able to create a booklet that is sturdy enough to withstand continued use. This also allowed us to create a self-cover piece (the cover is printed on the same stock as the interior pages), providing a cost savings for our customer. All pages were printed 4 color with an aqueous coating. This coating allows for additional durability, which is important for a piece that may frequently be used around food products. This package insert was printed, scored, trimmed and saddle-stitched in-house. By producing the entire job on-site, we were able to reduce costs and ensure a quicker turn-around than if we had to outsource portions of the job. You can always count on Flottman Company to produce a quality job within a quick time frame. Can your company benefit from implementing package inserts? Or would you like your inserts produced more quickly at a lower cost? Request a quote today to find out how Flottman Company can help you succeed!